Members of the Laws programme visited Trinidad in November to deliver talks to students and members of the business community. Recordings of the talks by Professor Peter Alldridge, Draper’s Professor of Law at Queen Mary University of London will be available on the VLE shortly. The first talk was on Reform of Offences against the Person, and the second looked at corruption in cricket, which should interesting to those keen on jurisprudence (and not just cricket!). On the same visit, the Undergraduate Laws Programme collaborated with the British Caribbean Chamber of Commerce and the ACCA Caribbean to present a breakfast seminar on Transparency in Business “Exploring the UK Bribery Act and local initiatives for ensuring integrity”. 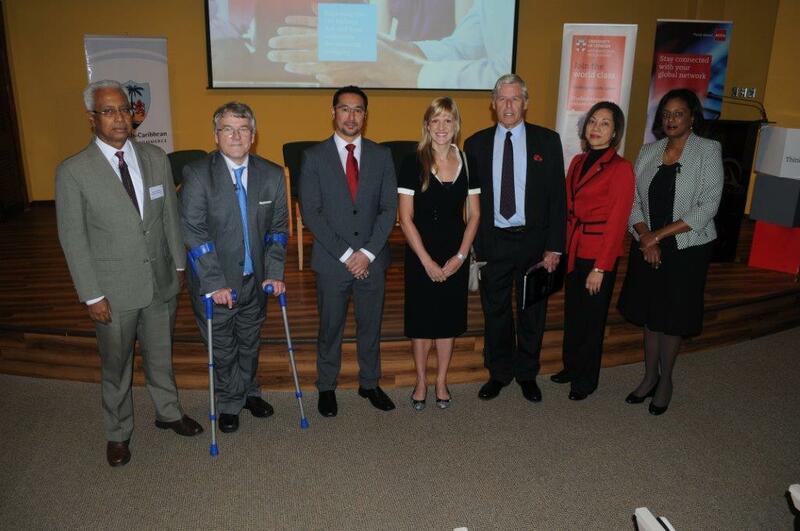 Professor Peter Alldridge, Brenda Lee Tang, Head of ACCA Caribbean, and Belinda James, Chairperson of the Trinidad and Tobago Anti-Money Laundering Committee, explored the main facets of existing legislation, regulations and guidelines to ensure transparency and integrity in conducting business. The seminar participants’ joint declared mission of seeking to reduce corruption, and improve transparency in both public and private life struck a compatible note with the new government’s agenda in Trinidad. Formal introductory remarks were provided by the Hon Stuart Young, Minister in the Ministry of the Attorney General and Legal Affairs, who announced that Whistle-blower Legislation would shortly be tabled in Parliament. Next Post: University of London Insitutions’ Moot Ghana February 2016.